As the seventh poet laureate of Canada, and as an Afro-Métis man, George Elliot Clarke has a unique perspective on the country he lives in. In government, policy, and society at large, Clarke sees not only systemic racism and sexism, but also a path forward for creating a more inclusive and genuinely multicultural Canada. 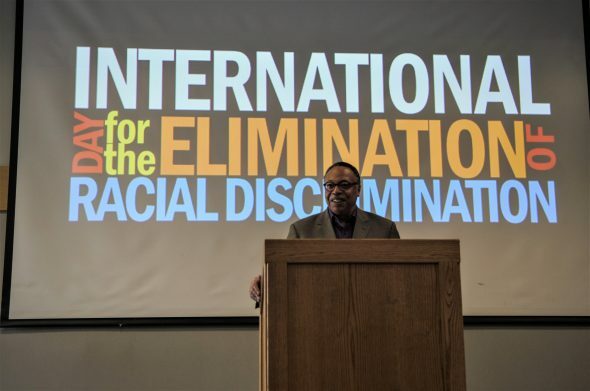 He addressed KPU students in the Surrey Cedar Conference Center on March 21 for the International Day for the Elimination of Racial Discrimination. His presentation followed several other, similarly-themed events on campus such as an anti-racism walk, forum, and film screening. “I’m here today to talk about the anti-racist Canada of the near future, and I want to get to that by talking about our past a little bit,” he said during his address. Clarke went on to explain how a book published by sociologist John Porter in 1965 relates to modern-day Canada and its current legislation by looking at the nation’s Constitution, its relationship to the Monarchy, and documents delegating various sorts of citizen statuses. All permanent residents in Canada have mobility rights, but those without that status do not. For those defined by the government as “visible minorities”—or “persons, other than Aboriginal peoples, who are non-Caucasian in race or non-white in colour”—this can be oppressive. The position of poet laureate can only be held by one person for a two-year term. Every two years a new poet is welcomed into the Canadian government, and every two years the native language of that poet switches between English and French.